MiniTec d.o.o. 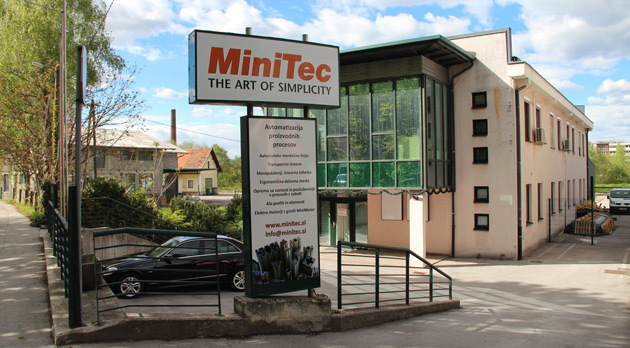 was established in October 2007 with the assistance of the global company MiniTec GmbH from Germany. We took over the product range that we market in the territories of countries from the former Yugoslavia. Besides sales, support and consulting, we have also expanded our operations into the field of machine manufacture. Thus we also engage in this segment with our own designing, machining, assembly and programming of logic controllers. The product range encompasses profiles, workstations, conveyors, transfer systems, specific machines and devices, guards and the outsourcing of machining. We have everything that a modern machine manufacture requires. Our quality and extensive sales range is quickly asserting itself in all branches of the industry thanks to our own packaged software MiniTec CADmenu, MiniTec iCAD and MiniTec iCAD Assembler, which will allow you to construct and order MiniTec elements and comprehensive solutions in the shortest time possible. The software comes free of charge! Our long-term goal is to become recognisable and respected by our customers, partners and the competition as a quality, fair and innovative business partner. We are aware how important it is to innovate and constantly improve our work and the product range and production programme. We build long-term partnerships and strive for improvements. Company name MiniTec , proizvodnja strojev in trgovina z elementi za avtomatizacij proizvodnje, d.o.o.